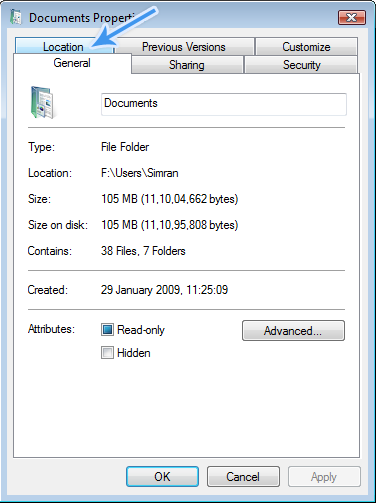 My documents folder comes pre-installed with your Windows installation and its default location is in Windows drive. But you can change this location to some other drive to protect yourself from any kind of data loss. It will also save disk space of Windows drive. If your system got any error and you need to immediately format your Windows drive, you can freely format your Windows drive without taking any backup as documents are stored in some other drive. Usually low hard disk space is kept for Windows drive, so if you are downloading larger files from internet, your Windows drive will show an error of low hard disk space. But if you change location of My Documents, you will not get such type of error. How to change location of My Documents? Step 1: Right click on My Documents folder and click on Properties. Now go to Location tab. 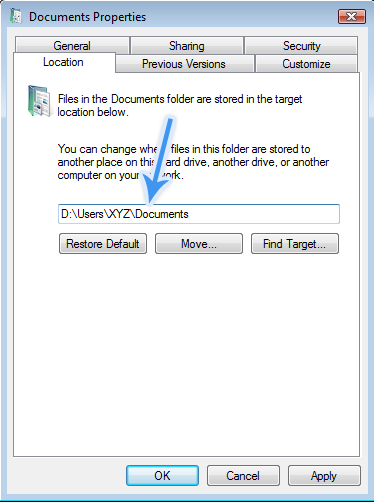 Step 2: Now fill in location of new drive where you want to store your Documents and click on OK button. Step 3: It will now ask you whether to move your existing documents or not. Click on Yes button. That’s all. Now your Documents will be stored in new drive. Cheers for this article. I used to do this with my old laptop, but I haven’t used it for a while and had forgot all about it.